I've been very slow at moving into the "digital" world to the amusement of many friends. Since my 35mm breaking a couple years ago, I started using disposable cameras at all of our get togethers and didn't mind getting picked on because of it. This past October when I found out I was getting a nice raise, I decided to buy Rob and I a digital camera, as Rob had mentioned getting one quite often for taking pictures of the birds in the yard and when we go birding. My friend Brian was great at helping me pick one out and answering all my questions, as I knew basically nothing except what I wanted it to be able to do. I surprised Rob with a really nice Canon digital camera, that he's been having a lot of fun with it. For a Christmas gift I also signed us both us up at Henry's for a camera course, Digital Camera Basics, that was recommended to me by Teena. We took the course yesterday, and we both learned so much! Rob had figured out so much on his own since getting the camera, that I was worried he wouldn't get anything out of the course, but he did. Our instructors name was Michael Willems, and I couldn't recommend him more. The class was 3 hours long, but it flew by, with a wealth of information (which you get to download at home) and was very informative in a way that even a beginner like me could understand. One of my biggest fears about digital pics, was not having prints. One of my most treasured items are my photo albums, I have many, from the time I was about 10 years old and my brother gave me my first camera as a birthday gift. I still take time to look at my albums on a pretty regular basis. Rob has calmed my fears about this. One of the first things he learned how to do was save pics to the computer and then to a disc and then he took them to Wal-mart and printed them out! 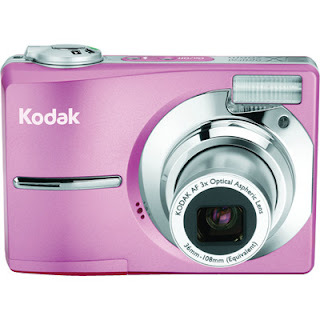 I must say, after the course yesterday, and knowing Rob can help show me how to save and print, I am seriously thinking of getting another digital camera for myself, something smaller that I can carry around in my purse. I might even get a pink one! Glad you enjoyed the workshop! I have been taking pix for years and got a lot out of it when I took it. You know I'm never without a camera in my bag. I like my Sony better but it's bigger. It was a better zoom and the quality of pix is better. My Olympus is smaller but I can't say I'm all that fuss about it. I usually have it with me because of it's size. The Canon we have has a good zoom, and I'll use that when going on vacation and such. I just wanted to get a little and cheaper one for my purse, mainly for shots of us at events and stuff, I think this one will do the trick. I looked at the sony one, but its quite a bit more. Nice camera. I am on to my second digital camera. (A Cannon).The new one has a zoom lens. I never get my photos printed LOL and has 3000+ images on i photo. Spent ages at the kitchen window trying to photograph a blackbird yesterday but he kept flying off.